Anyone who follows my writing know I write a lot about the Holocaust and the war crimes perpetuated by the Nazi State. I began studying this as an undergraduate and graduate level history student at California State University at Northridge under Dr. Helmut Heussler, who served as a wartime interrogator for the 82nd Airborne Division during the Second World War and then as an interpreter at the Major War Crime trials at Nuremberg. I studied under him for three years dealing with the end of Imperial Germany, the German Civil War, the Weimar Republic and the Nazi era. He gave me a lot of freedom to explore and research the subject and allowed me to do that research in undergraduate and graduate level independent study projects. I continued that study personally as well as during seminary and my second Master’s Degree in Military History. Since I read, speak and write German well and can often pass myself off as German in Germany because of my lack of an American accent when speaking the language. I speak German with a blend of a Bavarian and Hessen dialect and that helps when I visit various Holocaust sites, museums, and research centers in Germany. I will be doing some of that again this fall when I make another trip to Munich, Hessen, and Baden-Wurttemberg. Last week I spent five hours at the U.S. Holocaust Museum in Washington D.C. contemplating things that I mostly already knew while exploring details of the Holocaust that made it more real and personal. As I went through previous notes and research to teach my students I felt a tenseness and revulsion for the actions of those that ordered, committed or condoned these crimes; many of whom were like me, professional military officers, historians, and theologians. So I realize how easily it is for normal, rational, and even basically decent people to succumb to either participating in or turning a blind eye to crimes against others, even on a massive scale. In fact the bigger those crimes are they seem easier for some people to dismiss, because the victims cease be human, and simply a statistic. Sadly, Josef Stalin probably got human nature right when he said “The death of one man is a tragedy. The death of millions is a statistic.” That comment causes great revulsion in my soul, but I have to admit it seems to be the way that many people deal with such great crimes. September 29th 2017 was the 76th anniversary of the Babi Yar massacre. It was committed by members of the SS Einsatzgruppen C near Kiev shortly after the German Army captured that city. 33,771 Jews were exterminated by the members of Sonderkommando 4b of Einsatzgruppen C as well as members of a number of Ordungspolizei, police battalions supported by the logistics and protection of the German Army. About 10,000 others, mainly Communist Officials and Gypsies were rounded up and killed in the same operation. The victims were stripped of all of their belongings taken to a ravine and shot. It was the second largest killing action by the various Einsatzgruppen in the war. The killings were done up close and personal. The men who conducted the operation either believed that the people that they were killing were sub-human, or did not have the courage to stand up and say no. Of course these are uncomfortable subjects. When I tell friends of the places that I have visited and studies I have done quite a few openly tell me that they find the subject so uncomfortable hat they could not visit those places. These friends span the political spectrum, just as did the people who said nothing or willingly followed orders to commit genocide in Nazi Germany. Babi Yar is just one example of how civilized people can get can commit great atrocities in the name of ideology and race, and it does not stand alone. The tragic fact is that it really doesn’t take much to condition people to go commit such crimes; just teach people from childhood that people of certain races or religions are less than human. Then subjugate them to incessant propaganda and then turn them loose using the pretext that they are killing terrorists or insurgents. In the coming days I am posting in small sections an article that I wrote that deals with the ideological as well as military reasons that brought about Babi Yar and so many other atrocities committed by the Nazis during the campaigns in Poland and the Soviet Union. The coming series of articles deal with the ideological as well as military reasons that brought about Babi Yar and so many other atrocities committed by the Nazis during the campaigns in Poland and the Soviet Union. I will probably intersperse other articles as the need arises but there will be five more sections to this series. As part of my academic work at the Staff College I teach military ethics as related to the Just War Theory. In the class on jus post bellum or justice after war I deal with the implication of participating in war crimes. It is a serious subject and in the class I attempt to make my students, all relatively senior officers from the United States and allied nations as uncomfortable as possible. I use a number of examples from the major war crimes trials at Nuremberg as well as the Generals Trial. I had an exceptionally good class over the past several weeks and that caused me to go back and do some revisions to a number articles that I have written in the past. I have published a version of this before but I have made some additions and expect that like my work on Gettysburg that this work too will be an ongoing project. As I went through previous notes and research I felt a tenseness and revulsion for the actions of those that ordered, committed or condoned these crimes, men who were like me professional officers. I realize how easily it is for normal, rational, and even basically decent people to succumb to either participating in or turning a blind eye to crimes against others, even on a massive scale, in fact the bigger they are they seem easier to dismiss, because the victims cease be human, and simply a statistic. Sadly, Josef Stalin probably got human nature right when he said “The death of one man is a tragedy. The death of millions is a statistic.” That comment causes great revulsion in my soul, but I have to admit it seems to be the way that many people deal with such great crimes. September 29th 2015 was the 74th anniversary of the Babi Yar massacre. It was committed by members of the SS Einsatzgruppen C near Kiev shortly after the German Army captured that city. 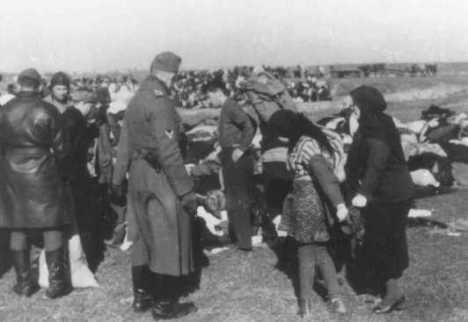 33,771 Jews were exterminated by the members of Sonderkommando 4b of Einsatzgruppen C as well as Police battalions. 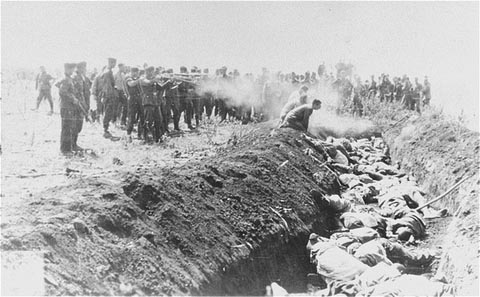 About 10,000 others, mainly Communist Officials and Gypsies were rounded up and killed in the same operation. The victims were stripped of all of their belongings taken to a ravine and shot. It was the second largest killing action by the various Einsatzgruppen in the war. It was committed by men who either believed that the people that they were killing were sub-human, or did not have the courage to stand up and say no. What happened at Babi Yar is just one example of how civilized people can get can commit great atrocities in the name of ideology and race, and it does not stand alone. The tragic fact is that it really doesn’t take much to condition people to go commit such crimes; just teach people from childhood that people of certain races or religions are less than human. Then subjugate them to incessant propaganda and then turn them loose using the pretext that they are killing terrorists or insurgents. The article deals with the ideological as well as military reasons that brought about Babi Yar and so many other atrocities committed by the Nazis during the campaigns in Poland and the Soviet Union. I am in the second day of my conference and as I noted yesterday that the presenter, Dr. Robert Grant is dealing with spirituality and trauma. As was the last time I listened to him this conference is full of good information. For me though it is not merely information for information sake, but something very personal having gone through the living hell of a psychological, spiritual and physical collapse following my tour in Iraq and battle with chronic PTSD. For me it was passing though the abyss and when I emerged I was a changed man. Today Dr. Grant began with some existential truths about life which have to be acknowledged. The basic list is his but I have taken those thoughts and ran with them. Everyone Dies…. We can’t get around this one a recent study said that 96% of Americans will die someday. No Guarantees…. We are not guaranteed anything in this life. You can live right, maintain good health, treat others right but still can meet with tragedy, betrayal and abandonment. No one can cover all contingencies…. No matter how well we plan there will be unanticipated events in life that shred our plans. The old saying that “no plan ever survives contact with the enemy” is true. We and our world are finite…. We have a beginning and an end and our finiteness is sandwiched between the creation and the consummation. Dietrich Bonhoeffer talked about “living in the uncomfortable middle.” Bonhoeffer was right, we don’t know the beginning because we were not there and we do not know the end because it has not yet happened. Evil and malevolence exists in individuals, organizations and systems, even those that we esteem highly…. One only has to look at the number of trusted people and organizations that have perpetrated and covered up their own evil acts to know the truth of this. Nothing exposes these truths faster than trauma. It does not matter if the trauma is impersonal and the result of a natural disaster or the result of individual or corporate evil and malevolence, be it physical, psychological or spiritual trauma the effect is often destructive. In response to these facts we all as well as our society and culture develop patterns of denial about these existential truths. They are truths that most of us don’t want to face and which we often will do anything to avoid most often attempting to find meaning and comfort in materialism and consumerism. Others seek a “solid” faith in more fundamental branches of their religious tradition. Still others see to recreate a world that supposedly existed before our time attempting to roll back the clock to a time when the world was right. This is true especially in our political life, progressives think back to the Great Society or the New Deal, while conservatives tend to look back to what the Founding Fathers wrote or the ones that they agree with wrote. The overarching theme, be it in the life philosophy, religion or political-ideological arena people seek to create a world that is stable, where they can exist in their comfort zone free of trauma and free of anxiety. However the experience of trauma often blows such constructs into a million pieces. The fact is that the comforts and protections that we seek refuge in are often fleeting or the myth that we have created for our self protection. Such beliefs are often illusions. One thing about trauma is that it tends to shake one’s world. In fact trauma can destroy long held belief structures including faith in God, humanity and deeply held beliefs about life and one’s place in the world. Religious beliefs, political ideologies and belief the righteousness of one’s country, friends, family and heroes can be devastated when trauma picks the lock of our soul and reveals our vulnerability. Such events including war, natural and manmade disasters, the loss of loved ones to death, divorce or the loss of one’s position in life, work and safety net all can be events that trigger crisis and reveal the startling truth that we are not invulnerable. The recent earthquake and Tsunami in Japan is a classic example as it has shaken the long held beliefs of the Japanese people regarding the respect that they have for their government and corporations. Collectively as Americans we have experienced numerous national traumas in the past 10 years beginning with the 9-11 attacks. We have seen war, financial disaster and numerous natural disasters which have impacted our collective psyche as a nation. In response we elect to deny the effect of trauma on us as individuals and on our society. Politicians seek to find quick material fixes to a greater problem which is both spiritual and existential. Simply put we seek to treat the symptom rather than the greater problem which is that we have been so shaken that we have stopped believing in our nation, our fellow human beings and sometimes even the Divine. We do the same as individuals because the darkness of trauma and the malevolence of those individuals and systems, governmental, corporate and ecclesiastical that inflict trauma on us is so great that we bear not to face them and face further trauma. The impact on individuals is often devastating as the perpetrators often use their power to dehumanize people. Thus facing the evil is to expose one to even greater danger. Thus the more common reaction is to edit the trauma, sealing it off so that we can reenter the safety of our protected sandbox without having to face the darkness that exists. The malevolence of evil, or what Hannah Arendt called the “banality of evil” manifests itself in ways that most of don’t ever want to face, thus the damage done by the trauma remains unhealed. The problem is in order to really experience healing we have to be willing to face that darkness without succumbing to it. To do this requires not only facing the existential truths about ourselves but also uncomfortable truths about respected individuals, government, corporate and ecclesiastical organizations and systems which perpetuate trauma. Most of us do not want to go there. I know I didn’t until my crisis became an existential one where I had to face the darkness or try to cover it up. For me it was a crisis of faith in God, my church and even in the actions of my government and the political party that I had been loyal to for 36 years. The journey was painful but in time I began to recover beginning a process that continues to this day and which I expect will be part an ongoing part of my life. In the process I know that I have changed hopefully for the better. As I began my recovery I found that not everyone understood, in fact when I began to write about my faith journey it cost me friends and resulted in me being asked to leave my church. To me it seemed that some people especially in the church were more comfortable with me being damaged and quiet than recovering and posing difficult questions especially when I deviated from the party line. I found that many people did not want to walk with me through those dark times and I can understand why not. To walk with someone through the darkness exposes us to that darkness and sometimes takes us to places that we would rather not go places that lay outside of our safety zone. However those that did walk with me, those who held me but let me walk though the crisis without trying to force feed me formulas for success or what I needed to do to “be healed” when I was in free fall gave me the freedom to experience healing. Part of that was healing was spiritual, God’s grace became real again and not just a concept. Part was psychological as I became more stable and had fewer symptomatic episodes, and part was physical as the nagging injuries healed and I was able to reassert control over my diet and exercise. Finally part has been relational as I have started to rebuild the relationship that I have with my wife Judy because I had neglected that relationship for far too long and when I came home from Iraq I did her no favors. A few weeks ago she told me that she felt that she had me back for the first time since Iraq. I have been through the abyss and have emerged from it different but I think better. I still have work to do because I know that I am still full of issues. I still have anxiety at night, trouble sleeping, especially without medication. Other times I can experience bouts of depression and anxiety and on some occasions still battle anger and occasionally rage when I feel endangered or see injustice being inflicted on others. I still have some measure of hyper-vigilance and hyper-arousal and I am much more aware of my surroundings than I used to be. Even in ministry I am careful what I share with people. I figure on this website people can pick and chose what they want to read, but when counseling or teaching I have to be more careful. I know that I have some deep work to do especially in relation to forgiveness of those people and systems that I felt hurt or betrayed me. I don’t know how all of that will work out but that is part of the journey. In the mean time I will walk in faith and hope even knowing that some of the answers that I seek will not always sit well with me or others. But then such is life.